Gift to the University from the artist. Jackie McElroy is a former Professor and Chair of the University of North Dakota Art Department. 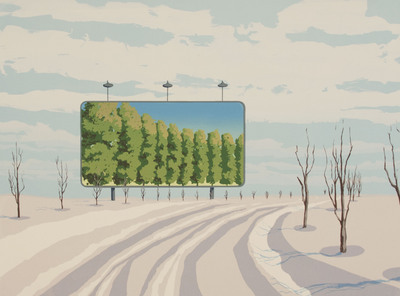 Inspired by the landscapes of eastern North Dakota, her print reveals interest in the intentional placement of green trees on a landscape via billboard. In her unusual landscapes, McElroy draws attention to the unexpected and illustrates how creative exploration of a physical location can reveal a uniqueness of place and culture.